Many articles have been written on the importance of including youth and women in national development and employment strategies in the Middle East and North Africa (MENA). Despite all good intentions, however, women are still a small percentage of the labor force in Arab countries, and government programs are skewed towards young men because they are considered a priority as lifelong earners while women face the challenge, if they choose, of balancing work and families. Successive US Administrations have made women’s empowerment, employment, and education a priority in foreign assistance programming. Unfortunately, the aftermath of the Arab Spring has not been friendly to women’s empowerment and youth enfranchisement, with few exceptions. One of them is Morocco. Fifteen years after King Mohammed VI delivered a speech – soon after acceding to the throne – calling for extensive reforms to promote the role of women in society, the country’s commitment is continually being tested and progressing. And the US government is helping by funding programs for youth, with a strong emphasis on inclusion. One such program has just concluded in Washington, DC, and I was fortunate to meet with the group on their last day. The program is TechGirls, “a U.S. Department of State initiative, which is an international exchange program designed to inspire and empower girls from the Middle East and North Africa to pursue deeper levels of training in technology through hands-on skills development,” as part of America’s continuing commitment to advance the rights of women and girls around the world. The program’s manager, since 2012, is Legacy International, which has been managing cultural exchange programs for 30 years. 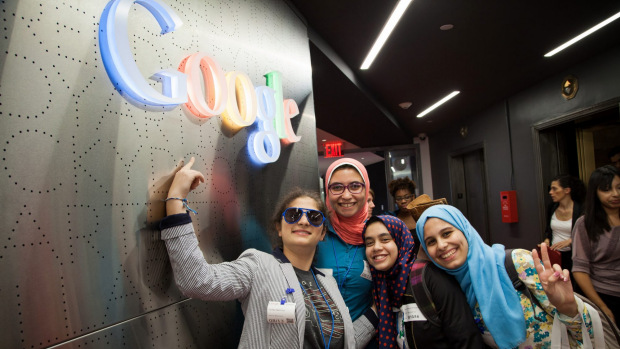 According to Mary Helwig, VP of Legacy International, “While in the United States, TechGirls participate in an interactive technology and computer camp, join a tech company for a day of job shadowing, and participate in community service initiatives.” This year’s cohort included young women from seven Arab countries, and their energy and vision are great antidotes to the feelings of frustration with the lack of progress in the region. We talked about entrepreneurship and what they want from their governments – mostly to provide the necessary eco-system of legal, financial, training, and incubating services – and how their experiences in the US gave them ideas about how to take initiatives when they return home. It should come as no surprise that the TechGirls are avid bloggers, tweeters, and Facebook users. #TechGirls provides hourly tweets of their daily activities and daily Facebook postings filled with pictures and narrative. They were able to pursue their interests in technology and community service during many of the program’s activities. On their last evening, they visited with Girls Who Code DC and General Assembly, a meeting that brought together the 27 MENA participants with 30 young women from DC who share their passion for technology. The program involved quite a wide variety of projects. For example, they started with a traditional summer camp experience at Global Youth Village, visited Virginia Tech University for an orientation to STEM programs, and spending a day on community projects after visiting Goodwill Industries in Roanoke. The four Moroccan participants were Amina Abou Ali (16), who wants to take her experiences back home and motivate other young women to embrace technology; 17 year-old Karima Lakouz, who plans to use her interest in technology as a driving force to help close the gender gap in engineering and technology; Khadija Chaibi (17), who will start a club at her school that will offer weekly classes to better inform her peers who might otherwise be illiterate in information technology; and 16 year-old Rihab Boutadghart, who wants to be a doctor because the area where she lives lacks medical services, and who hopes to use her medical and technology skills to develop medical materials to help people. They all were engaging, unafraid to speak their minds, clear in their interests in serving their communities, and encouraged by the many new friends they had made both within the group and in the US. One of their most satisfying experiences was to get to know Americans beyond media stereotypes and to appreciate the diversity and hospitality they found here. In turn, they were interested in learning more about American perceptions of Morocco and its society. To really get a sense of how the US is making very important investments in the youth of the MENA region, particularly those who have acquired English language skills and are grounded in technology, I encourage you to visit them on Facebook and experience US foreign assistance dollars well spent with young women who will change their communities.